There is just something about roasted chestnuts that says it's holiday time. 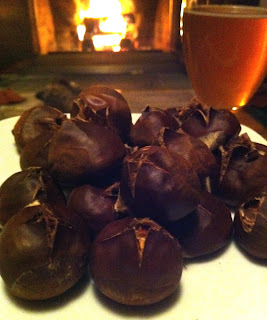 Much to my delight, I found local chestnuts from a vendor at the Fresh Nation Farmer's Markets in Danbury. The key is roasting really fresh nuts, don't let them sit around before you make them. They will peel much easier when fresh. Cut an "X" into the rounded top of each chestnut. Place the chestnuts cut side up in a single layer in a shallow baking dish. Pour in the water and roast for 20-30 minutes until the shells curl away from the nut meat. Take them out of the oven, wrap them in a cloth towel and let them cool for about 5 minutes. Chop them up and add them to your Thanksgiving stuffing (or dressing). Or just enjoy them plain, with citrus fruit, or dipped lightly in cinnamon and sugar. Here's to the start of the holiday season. Have a wonderful Thanksgiving! Adding these to stuffing is a fantastic idea! 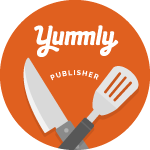 I'm going to have to add that to my recipe collection! Thanks!